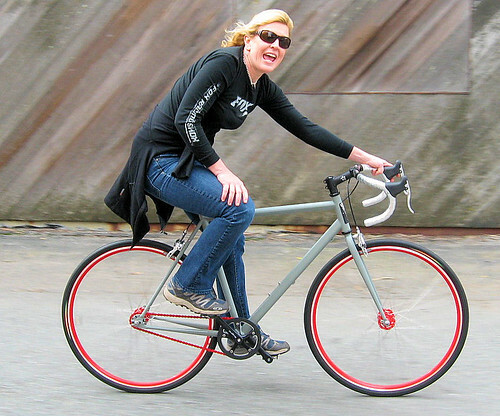 I was up in Sausalito for the Amgen Tour of California and spotted Erin of Swobo riding this hot Del Norte. CBB posted some spy photos of the Del Norte last fall; Erin says this bike will be available in about three weeks. This very sharp looking steel singlespeed is named for the Del Norte ferry boat that runs between San Francisco and Larkspur. Erin tells me the Del Norte will ship as shown in these photos. 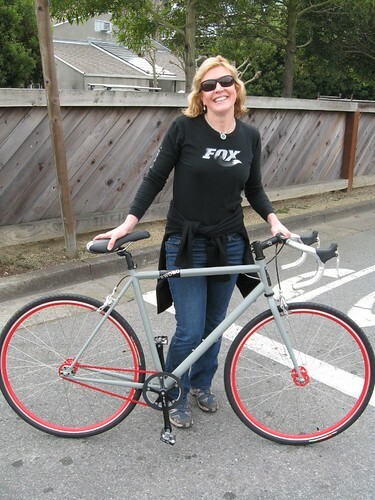 I forgot to ask her about pricing, but Swobo has a history of pricing their bikes to be affordable. But I can’t wait to see Bicycle Snob NYC’s fixie free-association for this one. I want that chain! I got the price from Swobo — MSRP $679. That bike is hot hot hot. The red chain and steel bar tape are great finishing touches. It’ll be available at the end of this month. That saddle angle- yowch! Tho, she is grinning pretty good, heheh. Roger that adamB. That’s a harsh dangleangle! My son and I were looking for a bike he could take to college. The best store in the east bay for cool bikes is Pegasus in Danville. I’m a cyclist and could never get my son on a bike. Once he saw this he had to have it. They hit the button when it comes to COOL! We paid MSRP and it’s worth every penny. The Red wheels, chain and silver metal bar tape are real eye catchers…..by the way we bought a Krypto lock and cable to try and keep the cooks at bay…….